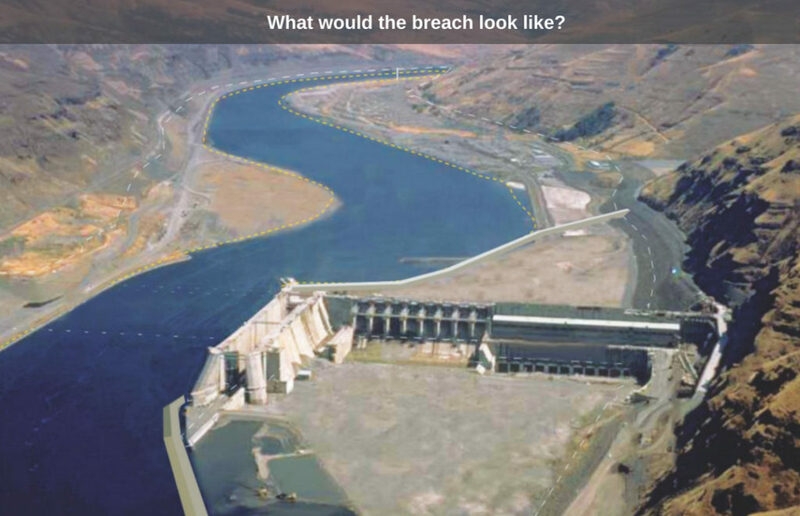 The idea of breaching the four lower Snake River dams has been around for decades. Fish biologists warned that they shouldn’t even be built, that they would eventually cause the extinction of salmon and steelhead. And the Army Corps of Engineers had a very difficult time proving that the dams would provide a positive cost:benefit ratio. Now with salmon abundance at lows not seen in decades, Southern Resident orca facing a food shortage, and BPA finally realizing they are in a serious budget crisis, the urgency to breach these four dams has never been greater. All essential components leading to both a viable hydrosystem and recovery of salmon and steelhead in the Columbia/Snake Basin are currently available, and they would save the public a fortune. The Army Corps must take a short time to update the 2002 EIS, then begin breaching Lower Granite Dam this fall. The dam removal sequence is Lower Granite, Little Goose, Lower Monumental and finally Ice Harbor. The US Army Corps of Engineers has inherent fiduciary responsibilities to insure existing projects continue to provide economic benefit. The dams have a Benefit to Cost ratio of 15¢ on the dollar (.15 to 1) in terms of National Economic Development, the standard by which the Corps must measure economic benefit. The Corps can put the projects into a “non-operational” status. This does not change the project Purpose thus does not need Congressional Authorization. Breaching is far easier than originally planned, making it possible to move from a decision to breach…to breaching in a matter of months, not years. Given the relative ease of hydraulically breaching an earthen embankment, there is no need for lengthy modeling, engineering, design or complicated/lengthy contracting. Drawdown Engineers of the 2002 EIS. In short, what the Corps’ Walla Walla District originally estimated would take several years in modeling, engineering, design and contracting and well over $70 million, can be done in a matter of months for around $1 million. It’s important to remember that complete removal is not necessary. Infrastructure can be left in place, while the earthen abutment is simply breached, or removed with bull dozers (see video below). A free flowing river will heal itself. Ever wondered what the term “breach” means? Here’s a quick animation that demonstrates each step. You’ll see that the dam infrastructure, the turbines, locks and the spillways remain in place. That’s what makes this method of restoring to a free flowing river so quick and relatively inexpensive.